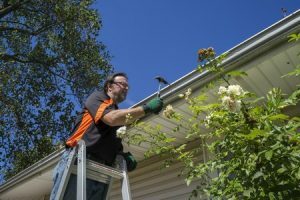 This time of year, many homeowners are climbing ladders to clean gutters, trim tree branches and repair damaged siding. These might be pretty routine maintenance tasks, but it’s important to remember that there are inherent safety risks associated with working on a ladder. With this in mind, homeowners should familiarize themselves with a few basic safety rules to ensure they’re able to get the job done right without putting themselves in harm’s way. Whenever you climb a ladder, make sure that you have at least two feet and one hand, or two hands and one foot in contact with the ladder at all times. This will help you maintain stability and ensure you don’t lose your grip as you climb. Check the Duty Rating of your ladder to make sure it will be able to support your weight and the weight of all the tools and supplies you’ll need for the task at hand. Your ladder should also be tall enough so that you don’t have to stand on the top rung while you work. It’s always better to have too much ladder, rather than not enough. Just because it’s summer doesn’t mean you should be climbing a ladder in flip flops. Always wear closed toe non-slip shoes when climbing a ladder to give you the grip you need to stay safe and secure. Be sure your shoes are clean and dry as well, because muddy soles can compromise traction. Whenever possible, you should work with a spotter who can hand you tools and keep an eye out for potential trouble. At the very least, you should never work on a ladder when you’re home alone. For more safety tips, check out these comprehensive ladder safety guidelines from the American Ladder Institute.